In 2019, GLL – the UK’s largest charitable leisure social enterprise - is set to support more than three thousand athletes, through its athlete support programme, the GLL Sport Foundation. Applications are open until 20th February 2019. The GLL Sport Foundation (GSF) supports athletes across 73 areas of the UK. 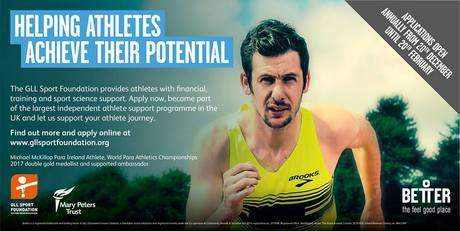 Supported athletes can benefit from financial support, physiotherapy, a ‘Better’ Gym membership and more. In 2019 GLL is investing over £1.6 million into the development of local athletes who aspire to follow in the footsteps of athletes such as Susie Rodgers, Dina Asher-Smith and Lutalo Muhammad. Double Olympic Taekwondo medallist Lutalo Muhammad explained: “GLL is a fantastic organisation paving the way for ordinary young people like myself to compete at the highest level. When I first started to compete internationally GLL was my only source of funding and I can sincerely say but for GLL, I would not have transitioned from a skinny kid that loved sport to an Olympic medallist, I'll never forget the help I received. “I am now focussed on Tokyo to complete my medal set and I am proud to be a GLL Sport Foundation ambassador now and into the future”.